The new Ghostbusters film, Ghostbusters: Answer the Call (2016), has raised the ire of the internet much to the surprise and disappointment of its director and cast. In an interview with the LA Times Kristin Wiig, who plays Erin Gilbert one of the film’s four lead characters, said that "the fact there was so much controversy ... didn't make me mad, it just really bummed me out." 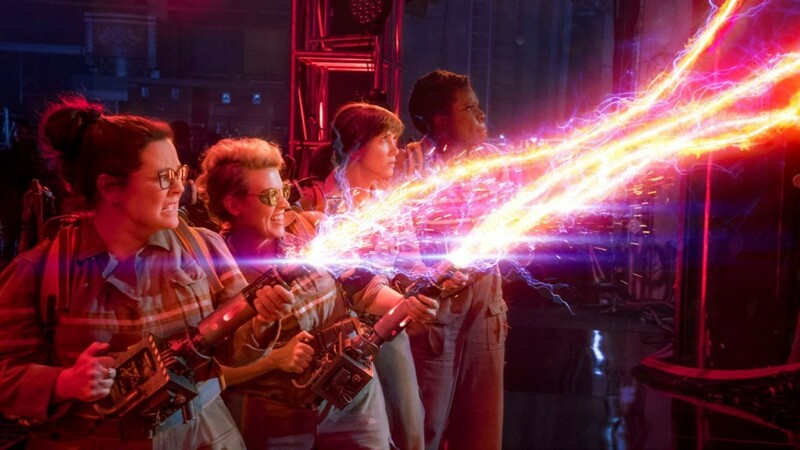 The controversy Wiig was speaking about was the choice to make the movie with four female lead characters whereas the original 1984 film, its sequel Ghostbusters II (1991), and its cartoon franchise The Real Ghostbusters (1986-1991), featured an all-male cast played by Bill Murray, Dan Aykroyd, Harold Ramis, and Ernie Hudson. The lead characters in the cartoon version were voiced by a number of men including Dave Coulier and Arsenio Hall. Ghostbusters: Answer the Call is the story of two former friends and ghost enthusiasts, Erin Gilbert (Kristin Wiig) and Abby Yates (Melissa McCarthy), who are reacquainted after a book they co-wrote, "Ghosts from Our Past: Both Literally and Figuratively: The Study of the Paranormal," resurfaces on Amazon.com just as Gilbert is reaching final approval for a tenured teaching position in the department of physics at Columbia University. After being laughed out of academia Gilbert is drawn into the experimental research of Yates and her quirky nuclear engineer collaborator Jillian Holtzmann (Kate McKinnon). Along the way they are joined by the streetwise and wisecracking Patty Tolan (Leslie Jones) a New York City Metropolitan Transportation Authority worker who leaves her job to bust ghosts. Their fledgling business couldn't come at a better moment as New York City begins experiencing an ever-increasing series of ghostly hauntings. However, these hauntings are not coincidental. A put-upon maintenance worker/janitor, Rowan North (Neil Casey), using Glibert and Yates' book, has produced a series of small devices that forces ghosts to appear. His master plan is to weaken the 'ley lines' that criss-cross New York city and bring about a ghost apocalypse in which he will finally have the power he so desperately seeks. The milquetoast North turns out to be a rather snide and spiteful little man who must be stopped before the city falls into perpetual chaos. A lot of the pre-release internet indignation toward this new film came in the form of disappointment and outrage at expected tampering with the childhood experiences and memories of fans of the original franchise. Far from flawless the Ghostbusters franchise probably doesn't deserve such reverence in the first place. What audiences will get with Ghostbusters: Answer the Call isn't something new or innovative but rather a rehashing of previous material. It's as if everything from the franchises’ past was put in a blender with a pinch of modern video game action sequencing, along with a dash of novel casting, then poured out into a Ghostbusters-shaped jelly mold. This missed opportunity for something fun and original is unfortunate. Perhaps the biggest issue is misplaced expectations; many people were nostalgically hoping for a new Ghostbusters film like the first one they loved. What they receive is a reboot-style Ghostbusters through the lens of comedy director Paul Feig. This is director Feig’s fourth collaboration with Melissa McCarthy. Previously the two worked together on Spy (2015), The Heat (2013) and Bridesmaids (2011) a wedding comedy which also featured Wiig. All three movies received an “R” MPAA rating and leaned heavily on crude humour, coarse language, awkwardness, and slapstick humour. Ghostbusters: Answer the Call is a PG/PG-13-rated film so much of what McCarthy and Feig have relied on for laughs in previous outings is largely unavailable to them which isn't to say this film would have been improved by the addition of more crude humour or coarse language. In the end, Ghostbusters: Answer the Call is not a particularly funny film although it's also fair to say that the subjective nature of comedy and what is funny makes producing a truly funny film very difficult. Connected to this, viewers may want to consider one of the film’s obvious weaknesses: Ghostbusters: Answer the Call is poorly written and lacks character development. Films like Feig's Spy (which shares this same creative defect) carefully distract audiences from paying too much attention to these weak points by employing crude humour and coarse language. However, when this distraction is not available in a PG-rated film the shortcomings in the writing department stick out like a sore thumb as is the case with this film. Canadian Ivan Reitman, the original director of the first two Ghostbusters films and one of thirteen producers on this new film along with fellow Canuck Dan Aykroyd, seemed better able to imbue his film’s characters with genuine warmth, a quality missing in Feig's film. This is most obvious in the character of Kevin (Chris Hemsworth) the Ghostbusters' receptionist who is relentlessly portrayed as dumb and inept. Annie Potts, who played the receptionist Janine Melnitz in Ghostbusters (1984), was portrayed as capable and mostly unimpressed by the goings-on at her workplace, and while it's true that her character became a bit more of a caricature in Ghostbusters II (1991), she never approaches the vapid nature of the new Ghostbusters’ receptionist Kevin who isn't even given a last name. Is there anything redeemable in the religious content of the film? No, there isn't. The first Ghostbusters film was a bit of a labour of love for Aykroyd who both co-wrote and acted in the film. In real life Aykroyd's family had a long history of fascination with and participation in the occult. Even still, Jesus and Scripture were mentioned in the course of the 1984 film in reference to a feared impending apocalypse. No such obvious mention of Jesus or Scripture surfaces in Ghostbusters: Answer the Call. The closest any character gets to quoting Scripture is during a throwaway slapstick exorcism gag when Tolan (Leslie Jones) slaps Yates (Melissa McCarthy) saying "The devil is a liar!" in a possible paraphrasing of John 8:44. What about the ghosts in the film? They are colourful and maintain a funhouse vibe but, unlike ghosts from a TV shows like Ghost Whisperer (2005 - 2010) the ghosts in Ghostbusters: Answer the Call are not misguided spirits who just need to find their way to the light, they are evil and out to get people. Even then, they aren't the spooky, make-the-audience-jump ghosts of movies like The Conjuring (2013) or The Conjuring 2 (2016). There is nothing particularly theologically important to note about the ghosts in this film. They are, in fact, not as important to the film as they were to the original Ghostbusters, mainly because Feig appears more focused on the comedy and not half as interested in the paranormal side of things as was Aykroyd. Does Ghostbusters: Answer the Call deserve all the press it has received? Perhaps, but not necessarily because of its female cast. Maybe it does because it could be a film that finally marks a tipping point in the recent Hollywood nostalgia craze. Or maybe it does because it's indicative of a geek-culture-bubble that will burst like the tech-bubble and the housing-bubble did. Who knows. If the film is guilty of a major crime indictable by the internet it's that it's a little boring and feels like it's both literally and figuratively riding on the ghostly coattails of the past. Ghostbusters: Answer the Call lacks both passion and belly laughs. Viewers who still love the original 1984 Ghostbusters film and want to sit down and spend a couple hours watching some Ghostbusters bust ghosts may be better served by just watching the original film at home.